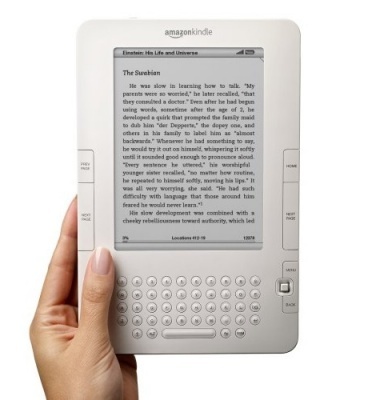 With so many e-readers available nowadays, it’s getting hard to choose which one fits you best. That’s why I thought I would share my experience with my Kindle. But before let me start by saying that I used to be one of those people that couldn’t imagine not holding an actual book when reading, but I recently was able to get over that when I realized how practical the Kindle really is. Now that doesn’t mean that I don’t read actual books anymore, especially since not all the books that I want to read are available on the Kindle, but when I do go out or travel it’s so much more practical to take the Kindle with me. – It’s light and small enough to carry in my bag. – I can have my whole library of ebooks on it. – I can download books wirelessly (no need to connect to a computer). – The screen doesn’t hurt my eyes like a computer screen does (which is one of the reasons I am not that excited about the iPads’ iBook feature). – You can change the font size. – You can download samples of books before actually buying them. – Not every ebook includes a chapter indicators (unfortunately that’s the publisher’s fault). – There is no backlight in case you’re reading in a dark place. That sort of sums it up for me. But this is of course only my experience with it and to be perfectly honest the only other e-reader that I got a close look at was the Sony reader, which I didn’t really like mostly because you have to actually plug it in to your computer to update it with new books. And of course I have seen the iPad, but my only issue reading books on it for me is the computer screen, but that doesn’t mean that I wouldn’t get an iPad (Apple fan here), it would just be for other reasons. So yes, I love my Kindle and I love reading books on it. In fact since getting one, I have been reading more books just because I love reading on it. But that’s just me, I’d love to hear about your experience with e-readers. Do you have one? If yes, which one and do you enjoy it? Or have you not yet embraced e-readers? Share your thoughts in the comment section below.